Shane McMahon and Daniel Bryan watch the finish of last week’s number one contender battle royal. AJ Styles walks up, and Shane and Daniel tell him that he’ll be facing Luke Harper tonight to determine the new number one contender. Styles doesn’t like that and starts insulting Harper. Harper walks up right behind Styles. Styles leaves, and Harper says “thank you” to Shane and Daniel. The Miz calls Cena a hypocrite. He uses Cena’s time off as an example, saying that Cena attacked The Rock for the very same thing. Miz says he’s the one that is here on SmackDown, doing media and making the show “must-see.” He explains that he threw Cena out of the battle royal last week because he wanted Cena to know how it feels to have an opportunity taken away. Miz then allows Cena to speak. ** Okay, so, I’m not jazzed about this feud for a few reasons. First, it’s probably good for The Miz that he’ll face Cena at Wrestlemania, but it feels like a step down for Cena to be in a mixed tag. Second, Nikki has been defending herself for months against accusations of using Cena to get to the top, but she’s going into the biggest Wrestlemania match of her career teamed up him. I’m not saying she’s there because of him, but that conclusion is very easy to draw and defend. Having said all that, I liked this segment. Cena has a way of making the best of any situation, and the verbal assault he subjected The Miz to was great. The beginning was very similar to a lot of the stuff he’s said to Styles over the last few months, but the personal stuff about Miz was cutting. And he didn’t even have to point out the fact that Miz has taken considerable time off as well. He went to shoot a movie while he was the IC Champ. This was an okay match, but it felt very uneventful and anti-climactic. Most of the time, a 2 out of 3 falls match should not be shorter than a typical television main event. It felt there was no real reason for the match, and it made the falls feel strange. I don’t like it when they add falls when a wrestler would usually kick out in a normal match, but they did that here. This needed much more time on the show, or it should have been saved for a PPV. Luke Harper has made peace with his demons. He can now see what true evil is. He’s not afraid of Wyatt, but Wyatt should be afraid of him. 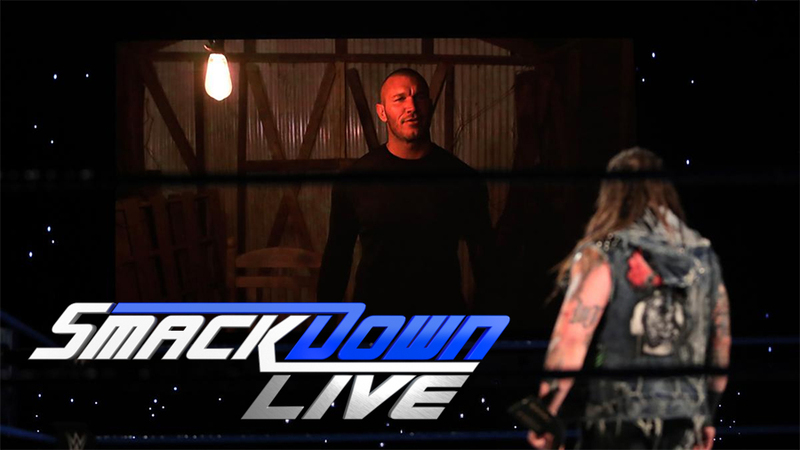 Bray Wyatt has a lot to say tonight, and he will say it with his brother, Randy Orton. Dasha Fuentes welcomes Alexa Bliss. Alexa is offended that Dasha asks her about her involvement in the previous match. Instead, she wants to talk about winning the SD Women’s Title. Natalya walks up and congratulates Alexa. She laughs and warns Alexa that she’s only champ until Natalya takes the title from her. Renee Young asks AJ Styles about his chances tonight. Styles says he’ll beat Harper and go on to main event Wrestlemania. Good match. Luke Harper looked great, dominating the majority of the first part of the match. It fit well with AJ’s character being overconfident, and it helped legitimize Harper’s ability as a singles wrestler. There was a false finish where one guy was pinned and the bell rang, but the match was restarted because the ref missed a foot on the ropes. It was okay, but that moment didn’t really seem to matter much in the end. Overall though, this was entertaining and was good for both guys. Renee Young asks Cena and Nikki about earlier tonight, but James Ellsworth and Carmella walk up. Carmella has Ellsworth insult Nikki. Cena has an idea, a mixed tag match next week. Nikki had the same idea, so it’s decided. Daniel Bryan congratulates Styles on his win. Styles refuses to shake Bryan’s hand. Curt Hawkins and referee Ryan Tran are in the ring. Dean Ambrose heads to the ring for the next match, but he hits Dirty Deeds on Hawkins before the bell can be rung. He gets on the mic and expresses his frustration with Baron Corbin. He wants a fight, so he calls Corbin to the ring. Corbin shows up on the tron and says he doesn’t come when he’s called. He tells Ambrose that he’s a deer in headlights about to be run over. Ambrose cost him the World Title, so Corbin will take everything from Ambrose. Neville wonders how anyone can take Jack Gallagher seriously. Tonight on 205 Live, Neville will remind Gallagher why he is the king of the cruiserweights. I liked this match more than I thought I would. I think a “Chairs Match” is a dumb stipulation, but I understand that it makes sense in this situation. Regardless, I really liked the usage of chairs in this match. They didn’t get overly complicated or build structures of anything, they just used one chair very effectively and brutally. This match was good, and it could have been a lot longer. It felt a little short, but that’s my only complaint. Bray Wyatt heads to the ring. He says that it didn’t matter if Harper or Styles because all mortals fear a deity. As Wyatt talks, Randy Orton shows up on the tron. He’s at the Wyatt compound. He says that he’s never been with Wyatt, he’s just been waiting to turn on him. Orton says that he’s standing on Abigail’s grave. Her skin and bones have been eaten by maggots, and all that’s left is her “wretched spirit.” He pours gasoline on what is presumably Abigail’s grave and sets it and the building he was in one fire. The show ends with Bray Wyatt distraught. It felt like there was an awful lot of talking on this show. That’s not always a bad thing, but it seemed to fill a lot of space on tonight’s show. The three matches were all fairly short. They weren’t bad, but they felt really short. Cena’s speech was probably the best talking moment of the night. Orton’s turn felt obvious, but I think it’s fine. It seems kind of quick since Wyatt only recently won the title, but I understand it’s been building for months. I just wonder what Orton’s end goal initially was. Obviously he wanted to break up Wyatt and Harper, which he did, but there’s no way he could have counted on Wyatt winning the World Title way back when this started. He had a better chance of winning it himself. I guess he just wanted to cause problems for Wyatt, but that’s not really a master plan. That’s just a vague idea. Chair matches are dumb in theory, but Ziggler and Crews made the most of it. It wasn’t a spectacular match, but it was good. The anger and aggression came through extremely well for both guys, and I think that’s what it was all about. It helped make the feud feel personal.